Inflorescences 6-15-flowered; bracts usually dark purple, sometimes paler and striped dark purple. Flowers: perianth lobes usually ascending; pedicel 1-15 mm, usually shorter than bracts. 2n = 18, 36, 54, 72, 90. Flowering mostly spring (Feb--Apr; as early as Dec in the south, as late as Jun--Jul for high-elevation populations). 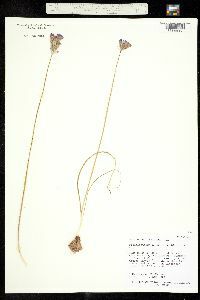 Most abundant in open woodlands and grasslands, but found in many habitat types; 0--2300 m; Calif., Oreg. ; n Mexico (Baja California, including islands). Many populations of subsp. capitatum may merit separate subspecific if not specific status. 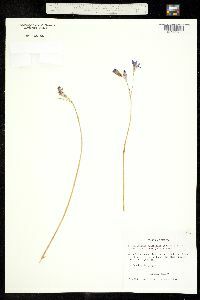 For example, the plants sometimes recognized separately as Dichelostemma lacuna-vernalis have a distinct morphology and favor vernal pools (L. W. Lenz 1974). However, they are no more distinct in morphology or habitat than are several other populations, and further study is needed (G. Keator 1992).